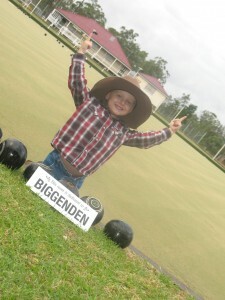 Bailey Marshall, grandson of Morrison Marshall, raises his fingers to say BIGGENDEN IS NUMBER ONE! 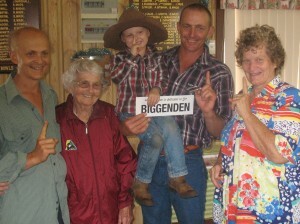 The town of Biggenden can stand tall having been the highest fundraiser for this year’s Rotary Lodge Naming Rights. The announcement was made at a recent Charity Bowls Day which the town organised in honour of Morrison James Marshall. The Bundaberg Health Services Foundation which manages and leases the lodge has established a special purpose-build fundraising account in honour of Mr Marshall who passed away in 2012. The event raised over $800 and is testimony to the wonderful support that Biggenden community gives to the Lodge each year. A very proud Marshall family fundraising in honour of their dad, husband, son and grandad – to help other patients in their time of need. This entry was posted on Tuesday, December 10th, 2013 at 6:50 am	and is filed under Rotary Lodge News. You can follow any responses to this entry through the RSS 2.0 feed. Both comments and pings are currently closed.